In 1785, when John Adams sat for Mather Brown in London, he was one of the best known political-figures in both the newly independent United States and in Europe. Adams first came to prominence in colonial Massachusetts, with his successful defense of British soldiers accused of murder in the Boston Massacre. Selected as a delegate to both the first and second congress (1774-1775), he was the most important leader for advocating independence. Striking up a friendship with Virginia delegate Thomas Jefferson, Adams suggested that Jefferson draft a decleration of Independence. .
During the 1780's, Adams served in important diplomatic posts in France and Holland, then as an American ambassador in London. 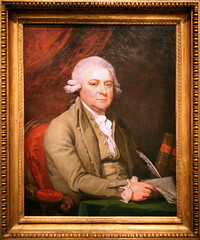 When Jefferson the US Ambassador to France, visited Adams in London, Adams had this copy of his portrait made for his friend. Adams served under George Washington as this countries first vice-president..